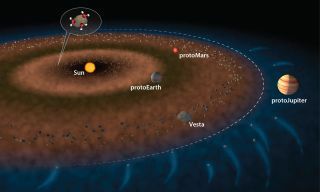 An illustration of the early solar system shows proto-Earth, proto-Mars, Vesta within the asteroid belt, and proto-Jupiter. The dashed white line represents the "snow line" boundary for water ice in the solar system. The water that supports life on Earth may have been on the planet much earlier than scientists previously thought, new research suggests. While the environmental conditions in Earth's early years made it impossible for water to remain on the planet's surface, scientists have found evidence that the ingredients for water were protectively stored inside rocky bodies near our planet — and maybe inside Earth itself. The new findings suggest that there was water in the inner solar system 135 million years earlier than previous evidence had shown. The smoking gun appears inside meteorites that once belonged to the asteroid Vesta, one of the largest members of the asteroid belt that sits between Jupiter and Mars. Meteorites from Vesta —dark chunks of cooled magma often as big as grapefruits — continue to be found in Antarctica. Previous analysis found no water or water-forming ingredients in those meteorites. But Sarafian and his colleagues zoomed in on the molecular contents of the meteorites, and found trace amounts of hydrogen-oxygen molecules. More than 4.5 billion years ago — or about 15 million years after solid bodies began to form around the young sun — water existed in the outer, cooler parts of the solar system, previous studies have shown. But in the inner solar system, where Vesta and a young Earth resided, temperatures were far too hot and solar winds would send any water vapor to the outer regions of the solar system. While the Earth grew and changed over the next 4 billion years or so, Vesta remained frozen in time, according to Sarafian. "Vesta gives us a snapshot of what Earth maybe looked like when it was first forming," Sarafian said. This image of the giant asteroid Vesta was captured by NASA's Dawn spacecraft on Sept. 5, 2012. Vesta also has the same chemical fingerprint as the Earth. In other words, scientists have previously shown that the nitrogen on Vesta likely originated from the same source as the nitrogen on Earth. Some bodies in the solar system, like the sun or comets, have different chemical signatures. According to Sarafian, the new study shows that Vesta and Earth also share a hydrogen chemical signature. The Earth also shares a chemical fingerprint with the moon, which, like Vesta, gives scientists a window to the past. Scientists have found traces of water in lunar rocks, which provides evidence that the life-giving liquid was in the inner solar system as early as 150 million years after the birth of the solar system. The Vesta samples predate the lunar samples by 135 million years. The jump back in time is significant, says Sarafian, because during those first 150 million years, the inner solar system was considerably hotter and more hostile than it was later on. Earth would have experienced major impacts from flying debris (it was potentially such an impact that broke off a portion of the Earth and formed the moon). Many scientists have suspect that through those big impacts and high temperatures, it would make sense for the hydrogen to turn into vapor and be blown out into space. "The planets held on to the water somehow," Sarafian said. "That's going to make people rethink how planets are made." Sarafian said the work supports the view that the water came from icy bodies near Jupiter. The newly forming gas giant likely flung the chunks of rock and ice inward. Jupiter would have been located beyond what's known as the "snow line," or the point beyond which temperatures were cool enough for water to condense into liquid or solid form, he said. "There are models that predict that icy bodies from the outer solar system, around the Jupiter area, probably got flung into the inner solar system," Sarafian said. "But there was just no evidence for it. There wasn't any data to support the model. And our study is supporting it." Jeremy Boyce, a geochemist at UCLA who was not involved in the new study but has collaborated with two of the study's authors on other works, said the new study's claims of water in the early inner solar system are robust. But he added that it's still unclear just how much water was present. It's likely that to make the oceans present on Earth today, more water was delivered to Earth later in its life. "The extent to which [the early water] relates to water we see on the surface of the Earth is an open question," said Boyce. "What water was present in the early Earth and what arrived later — I don't think we know that yet." The new study is detailed in the Oct. 31 issue of the journal Science. Editor's Note: This article was updated to correct the following error: Adam Sarafian is a doctoral student at the MIT/Woods Hole Oceanographic Institution, not the Woods Hole Research Center. Email Calla Cofield at ccofield@space.com or follow her @callacofield.Follow us @Spacedotcom, Facebook and Google+. Original article on Space.com.